The FireStik Antenna Company is proud to provide the "World's Best" antenna stud mounts. The Firestik K4 antenna stud is the all-important bridge that links a two-way radio antenna and coaxial cable. In fact the stud mount is one of the most basic of CB antenna mount components. Besides linking the antenna to the mount, the stud allows for attaching antenna accessories such as springs and quick disconnects. The antenna stud handles the important task of transmitting signals between the radio transceiver and antenna. An inferior stud can be responsible for unnecessary signal loss. The best prevention for signal loss is to use top quality components in the antenna setup. Firestik stud mounts have earned their reputation for top quality through outstanding design and only using the highest quality components. Heavy duty all stainless steel hardware with nylon insulators ensure long, trouble free service life. FireStik stud mounts are available for three different coaxial cable terminators and sized to fit standard ½ inch mounting holes. The K4X stud is for non-PL259 terminated coax and utilizes ring terminal connectors. The K4A stud has an SO239 connector for use with PL-259 terminated coax. And the K4R stud mount is specifically for use with the Firestik Antenna Company's proprietary Fire-Ring coax termination. 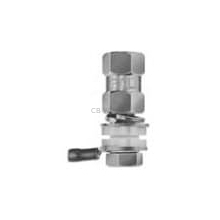 CB antenna studs are included with most CB antenna mounts. We sell them separately for customers that have pre-fabricated mounts, L-brackets, or "tabs" on headache racks with a 1/2 inch hole that still need the stud to mount an antenna.